The unseasonal weather continues, so we are tidying and weeding before the weather turns. The mild weather is not a friend to the garden, with mildew growing fast. We need some good cold weather to kill the bugs and slugs!! Still we think of next year. The spring cabbages have been planted out, the onions and garlic are showing green shoots. Today I sowed nine large pots of Sweet Peas as the seeds had started to germinate. I am reducing my paperwork, getting rid of my demons that hold me back. Recycling and composting, putting a waste of paper to good use. Today is a mixture of showers and sparkling sunshine. The house is tidier and calmer because of that, and I will have another go at pushing the tide of paperwork away!! The clocks went back today, and I have daylight at "my" end of the day for a while. I baked cakes, made crabpear and crabapple jelly- very nice with an aftertaste of pear. The egg delivery has been sorted. Mountain Man was in a hurry today. I wonder what he was late for! The garden can wait for tomorrow, I don't feel like getting cold, wet and grubby!! My costs have reduced- I have cheaper house insurance, thanks to the National Farmers' Union, added insurance for workshop, public liability and some other stuff- and ended up paying £3 more a month overall.!! Then I asked them for a quote on the car insurance- £80 cheaper, which made my present company say they would reduce my bill to only £3 more than the NFU quote....£3 a year that is!! This makes life feel much better! will cost about £100 to start with, then £20 a time for the stall however big. Each firing sends you on to the next, aiming to do as well, or do better! I find that I am using the wrong sort of porcelain for saltglazing-but it might do well mixed with the stoneware clay body I use. Next step is a local Farmers' Market, and more glazing for firing in a month's time. A shocking sight greeted me today at the allotments. It could have been a lot worse, but the Fire Brigade arrived in less than three minutes of the call. About a third of the length has lost its plastic across two thirds of its width. We have enough plastic to mend it, and take it through the winter, but it really needs a new cover. We worried more about the fumes of the burning plastic affecting the people in the terrace by the gardens. I know we needed to tidy up that corner, but he didn't need to lose two pairs of wellingtons, two pairs of walking boots and a pair of shoes, besides spectacles, hand tools, scissors and knives and all the seed trays. After clearing the mess we adjourned to my house for a cup of tea and lunch. We had had enough for one day, so we went to check the ponies on the mountain, and found ten on Twmbarlwm. Also two lads letting their dog run loose and chase the ponies as they sat and talked. As Mountain Man said, good thing for them he didn't have a gun with him. He would have been within his rights, especially as it was going for one mare and scaring her down a steep rough slope. One stumble, one broken leg.... You don't let Rottweilers run loose on a mountain with horses cattle and sheep about. The ponies calmed down, thankfully, and we looked across the mountain for the other sixteen-no sight of them, and at four o'clock, no time to go for a four hour walk looking for them!! Not from alcohol, just adrenaline!! Perhaps I should have stayed the extra two hours until the kiln firing ended. From being really tired and driving extra carefully, I landed at home, pootled around to wind down- but couldn't sleep till 2am. Having done that I woke at 8am, and managed to get a loaf baked for Mountain Man by the time he delivered the egg order (up to ten trays this time). It is a damp day, so no excuses I am staying in and trying to de-clutter...in short bursts, interspersed by a short time on the computer. Yesterday we finished packing the kiln. It was a damp day, going to dank as we finished!! 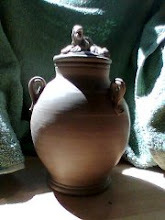 So the kiln was fired on low for four hours or so- until it stopped steaming!! Then close all vents and turn off until 5am. Then I joined the firing crew by 11.30am. Today was beautiful, and quite warm until mid-afternoon. I was out in Tshirt and jeans, collecting windfall apples and pears in the orchard in the Walled Garden there. I left at 10pm, with a forty minute drive ahead of me, made longer by being dazzled by drivers with over-bright and/or undipped headlights. Roll on Wednesday and kiln opening!! Stress is making me fray at the edges, so I got some ointment and a smile from the doctor, and a hug from Mountain Man. My 'Mother' (dough starter) needs caring for and feeding every day, and so makes better bread. I think that applies to me too! The nights are the worst- I long for his company, and to wake beside him, wherever and whatever the time. I look forward to when he can leave his past behind and step to the future with me. Today I started to get help with the battle with The System . It is, for me , getting what I am entitled to. For The System it is about reducing numbers, statistics and politics. It stresses me when I am already too stressed. Hopefully getting help will succeed, at least having someone there to "hold ones hand" in figurative terms. Then after a couple of hour's respite, the rain started again in earnest. So we had our sandwich lunch at home with a hot cup of tea and I took Mountain Man back up his Mountain. From the mountain the mist was flowing down Cwm Gwyddon like a river, as we said goodbye for today in the sun. Coming back down through the woods the cloud was sliding through the trees in an eery manner. Then at the foot of the mountain I came back into the sun. Today we were both tired, Mountain Man and me. Housework took TOO long, so I was not in the Garden until after 11am. He was tired after a long day fetching a friend's pony then taking it, with his friend to be sold at the sales, sixty miles away. So we were both subdued, and he went back up the mountain soon after an early lunch. I have applied myself to tidying, sorting and reducing, starting in the hall. Now the clutter is that on the way to be freegled or recycled. Before supper I dug out a quarter of the new greenhouse site and topped up another bed with the earth. I have made not a list, but a board with sticky notes on that can be removed when done, and jobs can be prioritized by where they are. So I am feeling more positive and constructive. I would still rather be going home with my man, away from all the noise and people. To have someone and somewhere to come home to. I still don't know what is stopping him from letting himself be happy again, which makes me sad. Today was the AGM of the South Wales Potters' association. The bread took AGES to rise, but at last was baked in time to take for lunch. The Carpenter is off to Germany to work for a few days. The Oily One is at last getting oily again, and is restoring a car ready to sell it. This morning's demonstration was by Joanna Howells who throws with porcelain and stoneware clays, and facets and alters the shapes. This is emphasized by fluid blue, white or green glazes. Lunch was splendid, a simple buffet, mostly home-made. Then thankfully a fairly brief meeting!! Today we reached the threequartersfull point on the kiln. I arrived late, after starting the bread which will be baked first thing tomorrow. As I drove towards Abergavenny, there appeared a huge rainbow- firmly rooted at the spot I was heading for!! We had a marvelous lunch- Homemade (and grown) tomato soup then homegrown salad and eggs from the chickens in the orchard. Rosemary has to bisque fire and glaze a few more pots, so packing finishes next Friday and firing starts early next Saturday. I drove home with a large bag of huge cooking apples and headed straight for the allotment garden! Sweetcorn to be picked, and chillis, rasberries, alpine strawberries, broccoli, and a few leeks lifted then the last of the carrots before the carrot fly decimates them. We have been glazing pots and mending the kiln for two days now and have started packing the kiln too- hopefully finishing tomorrow. Then we should be firing in a week's time when we have the gas. This has meant the garden has taken a back seat in the order of things. tough-I am not walking to a cold dark allotment, nearly ten minutes away!! All the potatoes are lifted, the bean beds dug over. I need to decide where the alliums are to go, but the planting has been a little haphazard this year, tending too the "see a gap and fill it" method of rotation!! I have been sorting and freegling some of the Geek Wizzard's excess belongings. I would like my living space back!!!! Now the Carpenter is back from London, having had to drive there and back for an hour's work...how crazy can you get?! At least he is getting paid for it. Life seems to be moving in the right direction, but I dread the winter. Not just the shorter days, the rain and gloom, the frustration of not being in the garden or out on the bike. The knowledge that Mountain Man will be staying up on his mountain for most of the time. I miss him enough now, and I see him nearly every day. Seeing him walk away up the track is hard. Giving him a lift up to the edge of his fields and having to drive back down the mountain alone really hurts. One day I will stay up there. But I don't know how, yet.